Viimsirahu Residences were designed by a famous architect firm Korrus OÜ and have been certified with energy class B in 2016 owing to the construction technology, autonomous and efficient systems of heating as well as ventilation solutions. Each apartment has a separate heat pump, boiler as well as electrical and water meters to ensure low power consumption. Vallox has developed a unique automatic defrost MC-system, which does not require pre-heating. 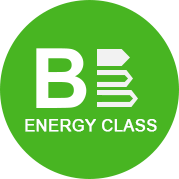 Owing to it, the plant was awarded a certificate of energy class A+. That is exactly why Vallox ventilation systems are well-suited for our climate. Vallox MV models can be connected to the Internet and managed online. With the help of a special program that allows to set the clock for the entire week, ventilation can be customised according to your lifestyle. The built-in humidity sensor that measures the level of exhaust air humidity adjusts the fan speed automatically. The air-water heat pump Daikin Altherma guarantees to maintain the comfort of your home at the outside temperature of up to -25 °C. All installations are thoroughly tested at low temperatures and extremely high humidity. Maximum efficiency is achieved through the use of a brand new type of compressor on Swing Düsproosium magnets, TWIN PAM processor, and fan. Optimised power consumption ensured the increase of the effectiveness factor to the mark of 4.5. Large plastic windows with triple glazing (thermal insulation property of U≤1,0 W/m2K ) perfectly transmit a large amount of light and visually expand the room. Beautiful veneer interior doors and insulated exterior doors are an integral design element of each house in Viimsirahu, linking beauty and luxury as well as guaranteeing safety! External and internal walls of concrete blocks provide excellent vapour transmission and allow the house to “breathe”. Double external wall insulation (250 mm) will protect you from the coastal winds and winter frosts. Reliable sound insulation will not allow street noise to disturb your peace. Each room of the residence boasts adjustable floor heating regulated by a room thermostat, preserving the health of the entire family. Sauna will help you relax after a hard day at work, and a fireplace will transform your home into the epitome of cosiness, also giving you a brilliant opportunity to be able to enjoy family evenings in the living room in front of the hearth. Each residence is equipped with 2-3 car parking spaces included in the cost. If you care about the environment and prefer the electric car to the common one, you will definitely appreciate the unique opportunity to be able to charge your electric car at home! Viimsirahu Residences are located in a comfortable area, where you and your family will always be safe. All houses can be equipped with security alarm systems to ensure reliable protection of private property. The developer provides full warranty on new residences valid for two years. All residences can be connected to the Internet via cable operators. Introduce the virtual world into your home, solve vital problems using the computer, and communicate with your friends on the social networks, connecting to a high-speed home Internet provided by Starman or Unitcom!